Thank you very much Jenny and Marion for this postcard, two lovely ladies that Geography Cat’s human met years ago whilst working in Colombia. This postcard could be said to carry an “iconic image”. 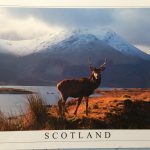 People seeing the image would automatically think of Scotland just by seeing the red stag and the snowy round topped mountains by a lake or loch. What would an iconic image of your home region look like?